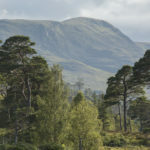 An osprey nest at Loch Arkaig which was struck by lightning and raided by a pine marten last year has welcomed back its resident pair for the 2019 season. 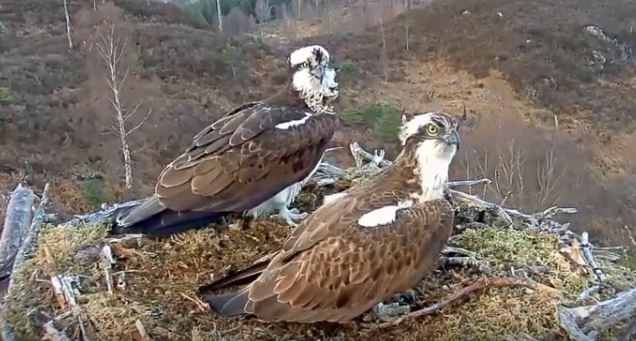 Louis and Aila arrived at the Lochaber nest together shortly after 7pm on Thursday night and began mating attempts within moments. Louis was seen delivering his first fish of the season to Aila last Friday morning. Woodland Trust Scotland hopes to see eggs laid before the end of the month. In 2018, three eggs were taken by a pine marten. The birds stayed around despite this but the camera went dark after being struck by lightning. George Anderson of Woodland Trust Scotland said: ‘It is such an emotional moment to see the birds back on the nest. They look in fantastic shape. Fingers crossed they will have a more successful year. ‘The kit has been completely refurbished. We have fitted a back-up second camera which we can switch over to if the first one fails. Surge protection has been added to various parts of the chain. One of the team from internet provider, Lochielnet, has been trained on how the system works so they can deal with most problems without waiting for a technician to come from elsewhere. Loch Arkaig is the most challenging nest camera site in the UK as there is no visitor centre, electricity supply or internet connection onsite. Everything has to be solar powered and the signal is beamed across the loch before it can enter the Lochielnet system then out to the world. 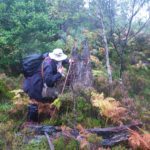 The live osprey nest camera at Loch Arkaig Pine Forest in Lochaber, supported by players of People’s Postcode Lottery, will live stream the nest until autumn. 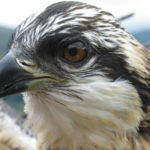 The osprey cam will be streamed live on the screen in the Lochaber Times office window on the High Street from this week.